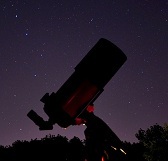 Image credit & copyright: SpaceX. Live stream link and press kit updates are typically the day prior. LAUNCH ALERT! Tuesday, May 22, 2018 at 12:47 PDT (15:47 EDT & 19:47 UTC) a previously launched SpaceX Falcon 9 (core B1043.2) will be launching from Vandenberg Air Force Base’s Space Launch Complex 4E (SLC-4E or “Slick” 4E) to deliver five Iridium satellites (NEXT 110, 147, 152, 161, 162) for the Iridium Corporation as well as the GRACE-FO 1 & 2 science satellites for NASA and the German Research Centre for Geosciences (GFZ). Stats: This will be SpaceX’s 10th launch of 2018 and the 61st SpaceX flight overall (5 Falcon 1, 55 Falcon 9, 1 Falcon Heavy). 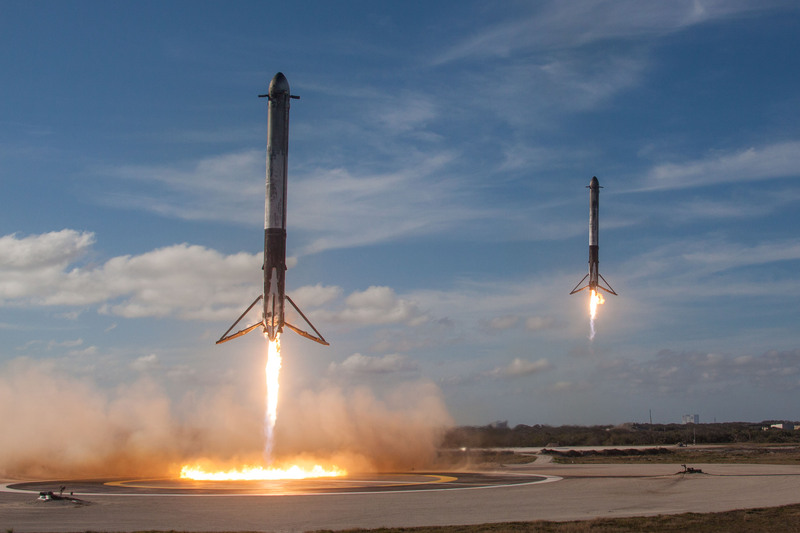 At this time it doesn’t appear that a landing attempt will be made so SpaceX’s landing successes will likely stand at 25; 14 on drone ships and 11 on land. Autonomous Spaceport Drone Ships (ASDS) were built at the Conrad Shipyard in Morgan City, Louisiana, the same place that NASA’s Pegasus barge was refitted to support the SLS program. Pegasus carried lots of equipment throughout the years but most famously the space shuttle external fuel tanks from NASA’s Michaud Plant in Louisiana to KSC. Dragon Spacecraft (when in use): The Dragon spacecraft is about 23.6 ft. (7.2 m) tall with trunk attached and 12 ft. (3.7 m) wide. It’s comprised of two main sections; the pressurized cargo area which can carry 388 cubic ft. of cargo as well as the unpressurized cargo area. The trunk (unpressurized area) carries 494 cubic ft. of cargo as well as the solar arrays. Dragon, along with Russia’s Progress & Soyuz, Europe’s (ESA) Automated Transfer Vehicle (ATV), Orbital ATK’s Cygnus and Japan’s (JAXA) H-II Transfer Vehicle (HTV), is one of only six vehicles that can fly to the Space Station. 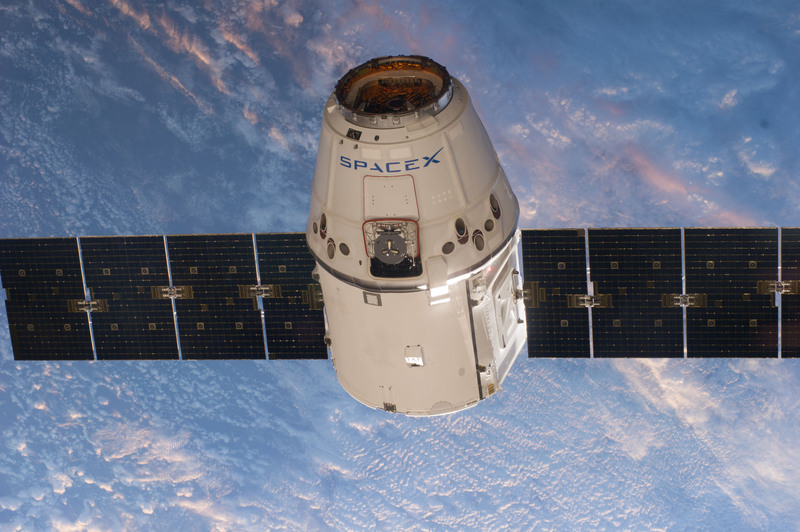 While Russia’s Soyuz is currently the only crewed means of reaching and returning from Station, SpaceX’s Dragon is currently the only means of returning experiments and supplies back to Earth from Station. Main Composite Payload Fairing (when in use): the two shell, composite payload fairing is 13 m (43 ft.) in length and 5.2 m (17 ft.) in diameter. The fairings are used to protect the spacecraft during ascent through atmospheric turbulence and into space. Once the rocket has reached a safe altitude the fairings jettisoned, exposing the spacecraft(s). Fuel: Chilled Rocket propellant-1 (RP-1) or highly refined kerosene. Lower specific impulse than liquid hydrogen (LH2) but is cheaper, room temperature stable, less explosive and denser. RP-1 is much more powerful than LH2 by volume and much less toxic than other room temperature fuels such as hydrazine (N2H4). Oxidizer: Subcooled Liquid Oxygen (LOX). LOX is often coupled with rocket propellant-1 (RP-1), liquid hydrogen (LH2) and methane (CH4) as it creates a high specific impulse. 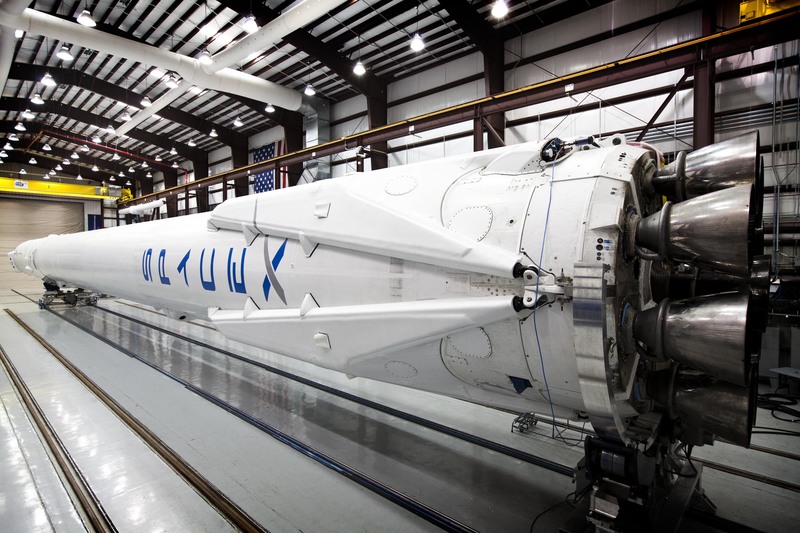 The interstage is a 4.4m (14.4 ft.) composite structure that connects the first stage to the second stage and holds the release and separation system. It’s an all pneumatic stage separation system for low shock, highly reliable separation that can be tested on the ground, unlike pyrotechnic systems used on most launch vehicles. 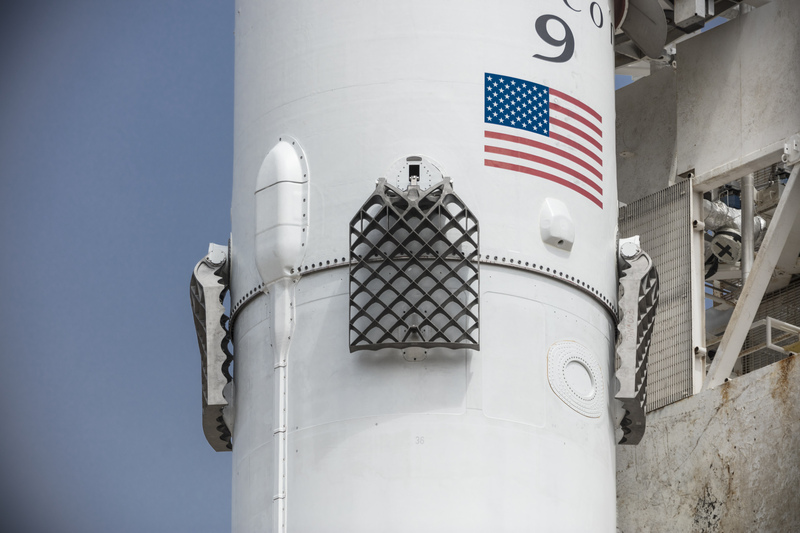 SpaceX Falcon 9 First Stage: First stage boosters are fitted with four independently steerable titanium grid fins that help control pitch, yaw and roll during vertical decent as well as four landing legs that extend before touchdown. 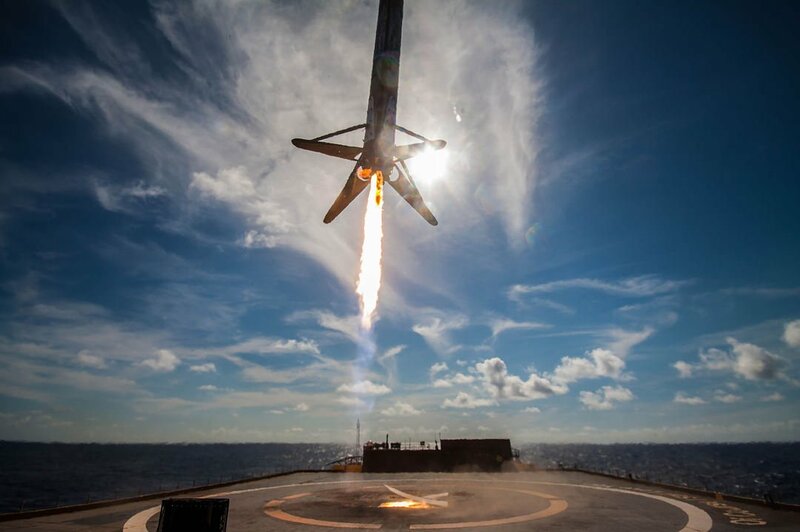 Single Merlin 1D Thrust (sea level/vacuum): 845 kN (189,964 lbf. )/914 kN (205,475 lbf. 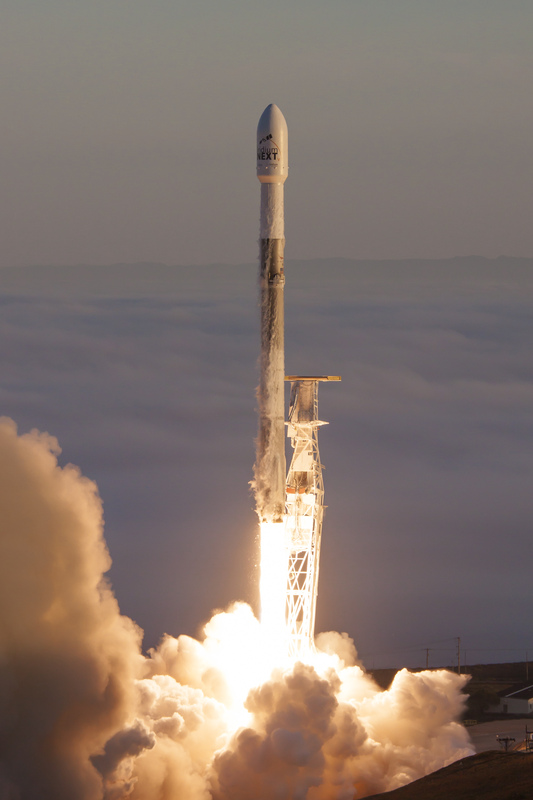 Image | This entry was posted in Images, Launches, News, People, Spaceflight Companies & Vehicles and tagged CA, California, DanSpace77, Elon Musk, Falcon 9, Falcon9, Iridium, Iridium 6, Iridium NEXT, SpaceX, Vandenberg, Vandenberg Air Force Base. Bookmark the permalink.